Does the A-Class live up to the Mercedes name? With that large star on the grille, you won't mistake it to be anything else, that's for sure. Even otherwise, the A-Class is a smart, expensive looking hatchback, something you would expect from a luxury car maker. It has taut surfacing, some flamboyant lines like on the doors, and it has a ground hugging stance which gives it a sporty aura. It seriously is a very desirable looking hatch. It's also built very well. From the way the doors feel to the way they close and even the shut lines all round have an immense sense of solidity. It feels equally well put together on the inside. There's soft grain plastic everywhere you touch and even the metal and high gloss finish inside the cabin conveys plushness. The A-Class in no way feels like a cheaper Mercedes, and that's a huge positive. Not that the A-Class is cheap - this petrol version will cost about ? 25 lakh when it is launched on May 30. What do I get for this sort of money? There is a lot of equipment on board. On the safety side of things, there's ESP which is extremely alert and a lot of time works so unobtrusively, you can't tell unless you see the car skidding sign on the instrument cluster flash. It gets seven airbags - one in the dash and the steering for the front two passengers, side airbags in the front and rear, and there are curtain airbags as well. The seventh airbag is the knee bag for the driver. It also has Attention Assist. A steaming coffee mug sign appears on the instrumentation when the car detects the driver is sleepy, suggesting, he take a break. This apart, there's ABS and the flashers also go berserk under hard braking indicating panic braking to the traffic behind. On the luxury end of things, there's a dual zone climate control system, a panoramic sunroof, electrically adjustable driver's seat, a multi functional steering wheel, cruise control and of course, Mercedes' COMAND system on a new touch screen interface that is significantly modern in look and feel. The COMAND system, worked via the rotary knob on the central tunnel, throws up options for the audio, a few system settings and Bluetooth telephony. It's not the best system out there, but does its job reasonably well. There are a few practical touches here and there as well including a couple of cup holders and some stowage options on the central tunnel, storage under the front armrest and useful door pockets at the front that can also hold bottles. The glovebox is reasonably generous too. Can I be chauffeur driven in it? Yes, but it's a bad idea. To begin with the rear seats aren't comfortable. The seat squabs are small and these offer no thigh support to speak of. Also, the back rest is too straight. Then there's the space, or the lack of it. The knee room thanks to the sculpted front seat is fine, but the head room and the shoulder room isn't great. The rear also feels very cramped; the small windows, the tiny rear windscreen and the large front seats which are tall and in your face ( quite literally) make you feel claustrophobic. Then of course there isn't a single luxury item at the back to pamper you; we are in a Mercedes, after all. There's no central armrest and no cup holders either. But is it fun to drive to justify being in the driver's seat? It sure is. The engine performance isn't great, yes, but the handling does put a smile on your face. The steering is quick and precise, and the car reacts to its inputs like a well trained dog. The car turns into corners without delay and feels neutral and composed all through. It also manages quick direction changes well feeling quite light on its feet, especially for a car that weighs over 1.3 tonne. It does exhibit understeer (this is a front wheel drive car and not rear wheel drive like a conventional Mercedes), but nothing minor corrections can't dial out. Now, if we had to nitpick, we'd say the A-Class could do with gripper tyres and a slightly softer suspension setup to handle bumpier corners; it does tend to skip and wallow a bit around bends that aren't surfaced well. 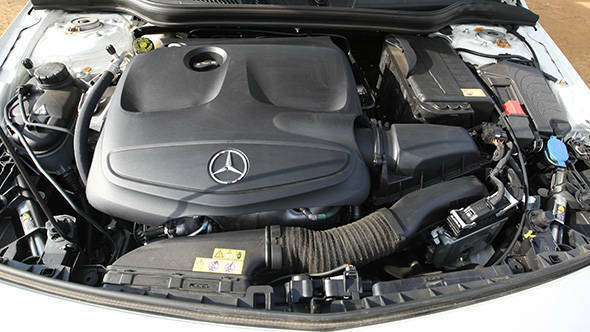 The engine is a 1.6-litre, turbocharged, direct injection petrol unit which makes 122PS of max power and 200NM of peak torque. Because it is turbocharged, all of this torque is available from lower rpms nearly all the way to the top. The engine is mated to a 7-speed dual clutch transmission for extracting both better performance and fuel economy. 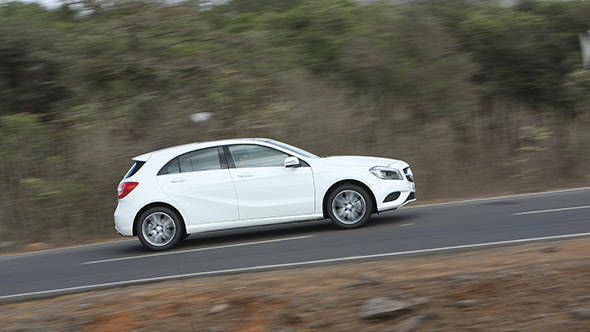 In our city run, the A180 returned 11.3kmpl when driven in E or Economy mode with the stop/start chipping in hugely. Also, the gearbox selects the highest gear possible keeping the engine revs below 3,000rpm at all times when driven peacefully, which again plays a big role in achieving this figure. In Sport mode, the fuel efficiency dropped to 8.8kmpl, but the throttle response was more instant, and overtaking, a lot easier. Performance wise, the A180 managed to hit 100kmph from a standstill in 9.6 seconds, which isn't bad at all, but it isn't something that will make you go wow! Moreover, the engine doesn't sound sporty enough for a turbo petrol. It doesn't dial in the revs quickly either. Overall, it isn't an engine that goes with the racy styling of the A-Class, and is in fact, quite average. Nonetheless, if the road and law permits, you can hit 200kmph, and the drivability in kickdown isn't bad either. As for the gearbox, it might be a dual clutch transmission, but it lacks the instantaneous reaction we have come to expect from such a gearbox. It takes its own sweet time to both shift up or down even when driven in manual mode. Our take - for spirited driving, stick to Sport mode. So is the A180 worth buying? It depends on what you are looking at. If you want a stylish, good to drive, well equipped car with a luxury badge, and don't mind the size, the A-Class fits the bill perfectly. Also, if you are short on dough, but simply can't do without a luxury nameplate to stand out in your friend circle, sure buy the A-Class. However, if you are rich enough to have other luxury cars in your garage and are looking for something manageable for the city or for ferrying the children around, we would suggest the B-Class for it is more practical and spacious. And if you want a small hatch just to have fun with, we'd say go get yourself a Mini hatch. 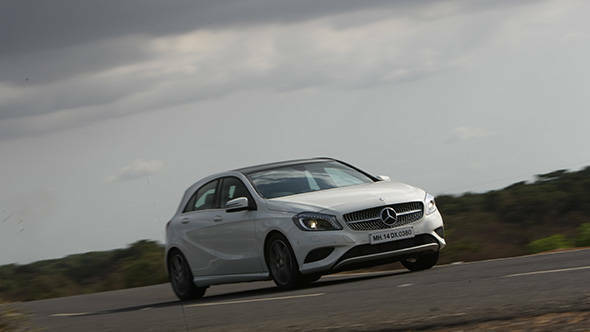 So again - why did Mercedes bring the A-Class to India? Given the initial success of the BMW X1 and the continued success of the Audi, there's a clear indication that lowering the entry level price point holds huge benefit for luxury car makers in India. But, it's also clear that Indians would rather put their money on SUVs more than anything else. 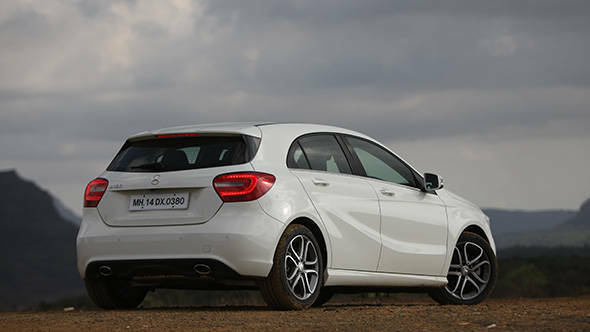 So why did Mercedes do a hatchback in the A-Class? Has it seen a trend most car makers have failed to spot? No, nothing so intense. It's simply down to the fact that Mercedes doesn't have an SUV at this price point unlike its competitors. So, it has brought the most affordable car it could, which is the A-Class. One can also gauge that Mercedes itself doesn't believe the A-Class is going to rake in the volumes from the fact that it is importing the A instead of assembling it. Both the X1 and the Q3 are assembled in India, by the way. However, going forward, Indians will be able to buy an affordable Mercedes SUV in the form of the GLA. It will be based on the same platform as the A-Class, will come with petrol and diesel engines, and it will most likely be assembled here giving it a price advantage the A simply doesn't have.